You are browsing the Blog for traveling - Scoop: The Appaman Blog. 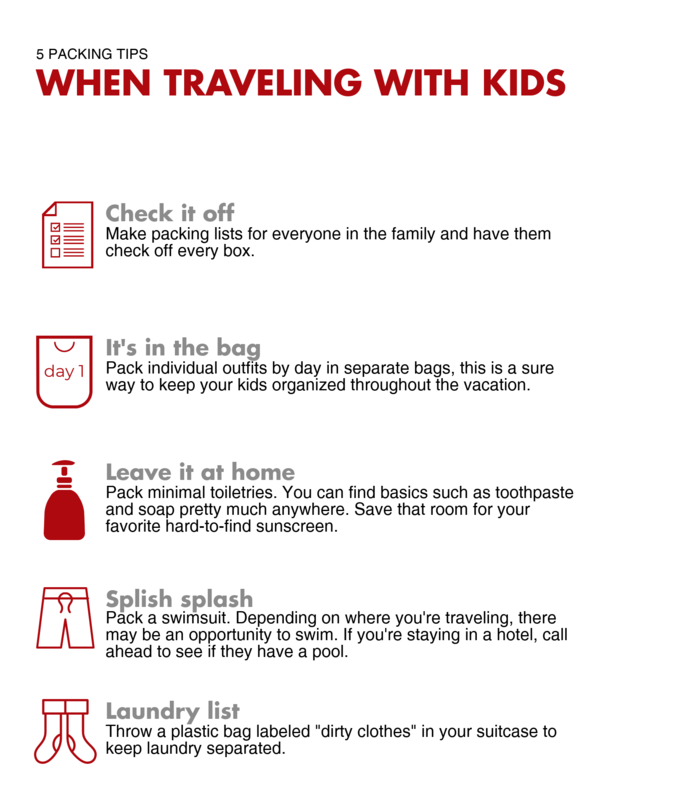 Getting ready to escape the cold on a warm-weather trip with your kids? 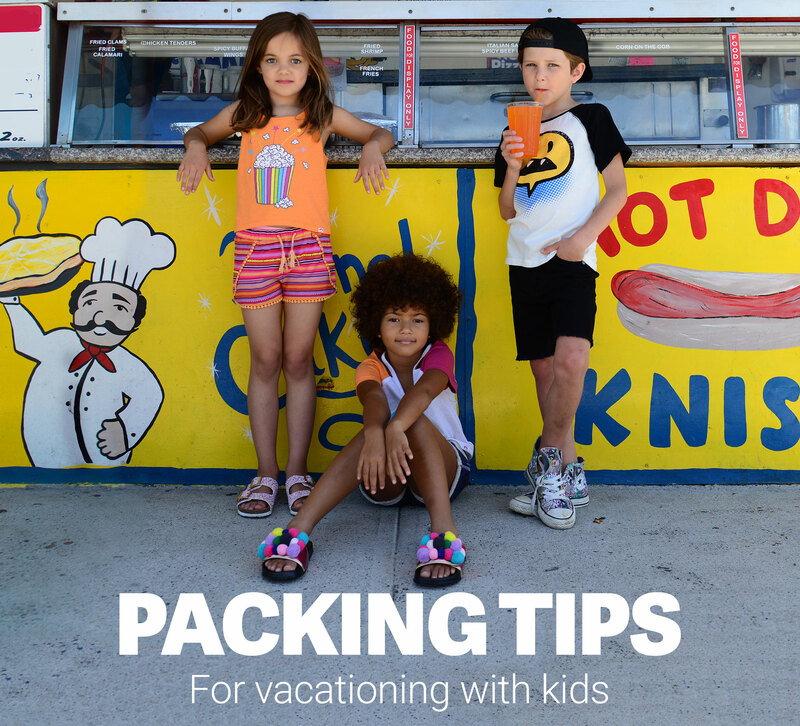 Not only do we have all-new vacation styles in our Getaway Shop, we have some top packing tips for you that we hope will help take some of the stress out of trip preparations, so you can focus on the fun. It’s only been a few months, but make sure to do a full try-on of swimwear, shorts, and any warm weather gear well in advance. Winter growth spurts can sneak by unnoticed, and you might have forgotten how stretched out or chlorine-damaged your swimsuits had gotten by the end of the summer season. Now is a great time for a refresh. When choosing sizes for winter and spring break trips, think forward about four to six months. To get the most out of your purchases, you probably want your vacation gear to last throughout summer, if possible. That said, too-big clothes aren’t comfortable or useful, so if you’re in between sizes, opt for garments that still look cool with an oversized fit, like a pullover top, or bottoms that have elastic or adjustable waists. Breezy button up shirts, like the Playa Shirt, can be dressed up, layered over tees, or worn on the beach as a cover-up. Dresses that double as cover ups, like the Ava Dress, can be worn alone as an outfit, with swimwear, or layered with leggings. A tropical romper, like the Novia Romper, combines a top and bottom in one. It’s as cute as a dress, but made for playtime. To transition from chilly planes or cool nights to sunny, warm post-pool days, we love a loop terry sweatshirt. You’ll almost always find this sort of material in our spring/summer line. It’s not fuzzy fleece, so it’s comfortable on still-wet skin (like a towel). Lightweight twill pants or stylish sweats are more versatile than heavy jeans for traveling between climates. Quick dry shorts — such as the Hybrid Shorts or Copa Swim Shorts — are fantastic for travel. They fit like casual shorts but are made with the same light, water-friendly fabric as swim trunks, so they’re perfect for boating, rafting, or any activity where you might get splashed. When you’re not wearing them in the water, they double as casual clothes. Believe it or not, it can even rain in paradise! Pack for the possibility of bad weather — many tropical destinations experience short daily afternoon showers in the spring, or might be in the middle of rainy season. Pack a windbreaker (the Expedition Windbreaker, above, will be available in February) compact ponchos, quick-dry clothes, or shoes that can withstand a splash (we love waterproof, stylish, lightweight Natives). It’s also handy to bring a few plastic resealable zipper bags for an inexpensive way to instantly protect your phone, passport, or other paper goods in an unexpected storm or a not-so-dry boat ride. Have you ever put on a still-damp bathing suit first thing in the morning? Yuck! Packing two to three swimsuits per person can be a game-changer if you’re a family who loves the water, especially in humid locations where air-drying takes longer. Short sleeve and long sleeve rash guards have gotten very popular in recent years – and for good reason. They offer instant sun protection, and while a rash guard can’t replace sunscreen, it also can’t wash off and doesn’t need time to “sink in.” They also offer great protection from tumbles into the sand, so your boogie-boarding, snorkeling kids will love them. For girls, two-piece styles are convenient for kids who hate the on-and-off process for every bathroom trip, prefer to mix-and-match tops and bottoms, and can be more comfortable for a kid with a long torso. One-piece styles can be a no-fuss style for sporty, active girls, while bikinis provide the least amount of fabric to bunch up, and are the easiest to wear under cover-up dresses or other clothing. Appaman offer two swim trunk fits: First, the classic Swim Trunk, the knee-length board short, with California surfer style and elastic in the back waistband. Next, the Mid Length Swim Trunks, for kids who prefer a full elastic waist and a little less length. Both styles can be paired with either a long sleeved or short sleeved rash guard, so you can customize your swim suit to your needs. Who wants to spend their precious vacation folding and re-folding laundry, or digging to the bottom of a the family suitcase for a single sock? No one that we know. Packing cubes are the best travel hacks out there for sorting clothing by category or by person. You can have one for swim, one for shirts, one for pants. Or, each kid can get their own cubes, which can all pack efficiently in a shared suitcase. Nothing gets mixed up, and clothing is easy to find, distribute, and put away again. Store dirty clothes in extra cubes or in space-saving vacuum seal compression bags, which are also great for bulky or damp items. Does your family love to get up and out for a day of adventure? Pick up a few ultra lightweight nylon backpacks with padded straps, the kind popular with hikers and backpackers. There are tons to choose from, they take up almost no extra luggage space when not in use. Each kid can store their own personal items for the day, with room to spare for any souvenirs they might acquire. If your kids are old enough to read and follow a to-do list, they’re old enough to help pack! Provide them with a bag, a pen, and a checklist with a specific number of tops, bottoms, swimsuits, toys, et cetera. Not only will they get to share the excitement, they’ll take some ownership of the process and learn how to prepare for travel. Strollers, gear, and actual children can quickly take up all of your free arms. If your accommodations can easily accept packages, you can inquire about shipping your stuff ahead of time. Whether it will save on baggage fees depends on the airline, but it will surely save on airport hassle, especially if you are taking multiple flights or travel with a large family. Be sure to use a trackable service with a guaranteed delivery date, or a specialty luggage shipping service, to easily coordinate the arrival. Super planners…we’re talking to you! Being prepared is awesome, but don’t worry yourself or overpack preparing for every possible scenario. In all likelihood, it won’t be the end of the world if you forget something or pack a little too light. Other than IDs, travel documents and a select few must-haves, anything truly necessary is most likely available at your destination. After all, unless it’s incredibly remote, other people live there. Clothes can be washed or re-worn. Toothpaste can be located. USB cables are widely available. Don’t let preparation anxiety get in the way of the happy anticipation of time spent together with your loved ones. Inspired to start packing? Check out vacation styles for swim and sun here in the Appaman Getaway Shop. It’s time to escape the cold, but planning a trip with mini humans isn’t always easy. We’ve compiled some of our favorite tips to help make for easy packing. Have any great tips? Add in the comments below. 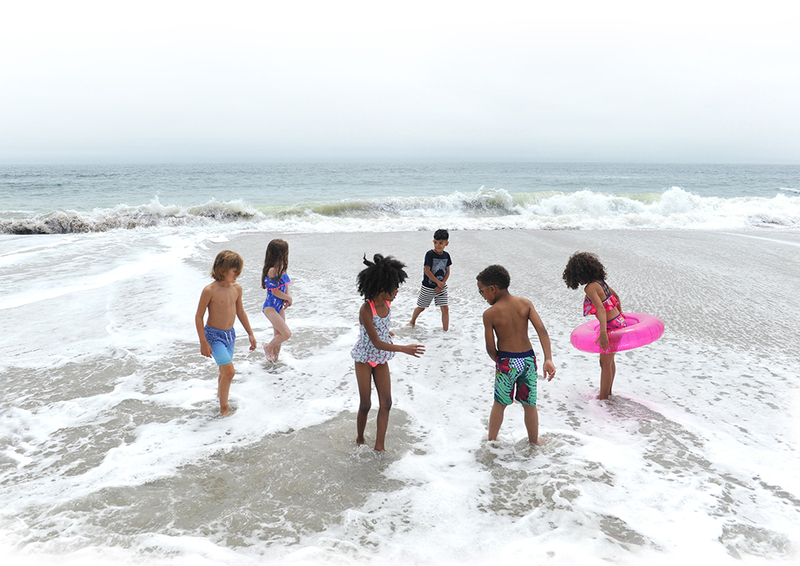 And if you’re still looking for kid’s vacay essentials, check out our latest Resort Collection.